I collaborated on this design with Fentress Architects director of design, Mike Winters. Civitas provided landscape architecture consulting. The Fort Collins Museum and Discovery Science Center are both long-time icons of the northern Colorado cultural landscape. When the two institutions began exploring independent capital campaigns in 2004 they decided to create a new joint venture between the two. 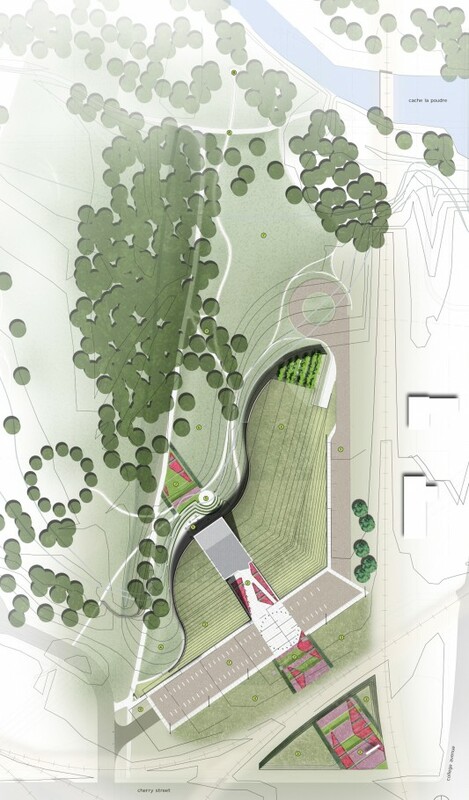 The new Discovery Museum blends into nature, holding a low profile, carved by the River’s Edge. At a point the building bursts from the ground as a beacon, connecting man and nature. The Museum’s entry is highly visible to approaching visitors. This immediately orients the visitor and provides easy visual way finding. 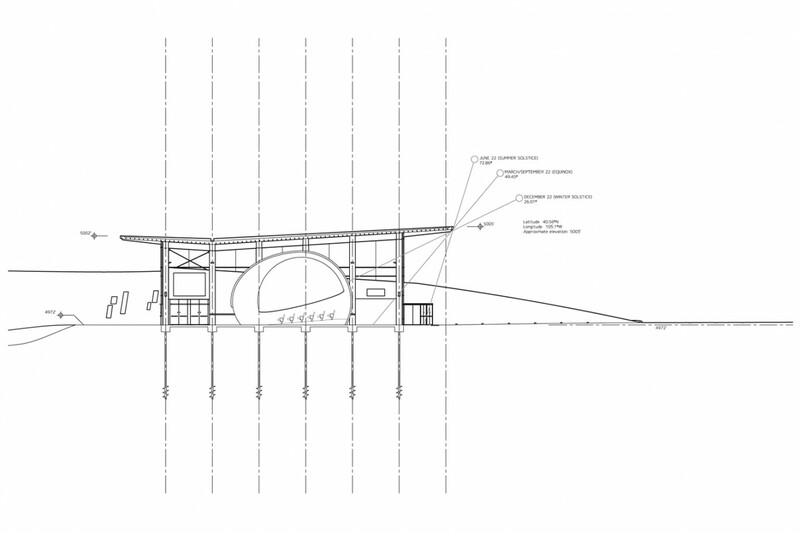 The plan for the Museum is very flexible and easy to understand. The entry lobby (Discovery Hall) organizes the building into two wings. To the left the spaces are for Education and Administration Offices. To the right the spaces are Exhibit Galleries and Collections. 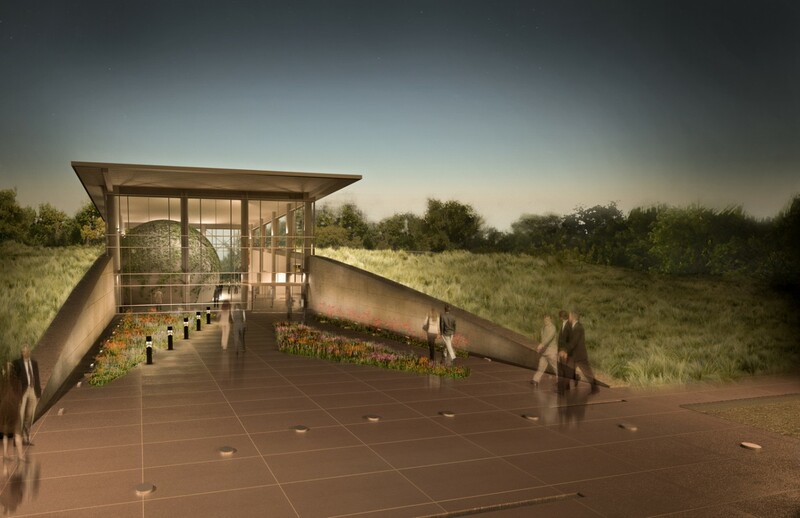 The Discovery Hall is the hub for all activities; ticketing, digital dome, food, gifts, outdoor access to the patio terrace and amphitheater, galleries, archives, and has been planned to accommodate large parties and fund raising events. The Discovery Hall is the Entrance Structure. It has a full-height high-performance low-e curtain wall system on the north and south sides, and clerestory glazing on the east and west. 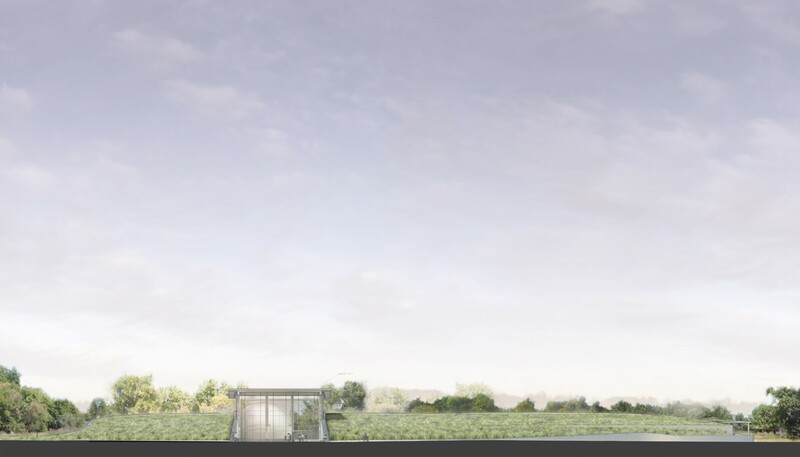 The roof has been designed for passive solar, clad with a Green roofing membrane. 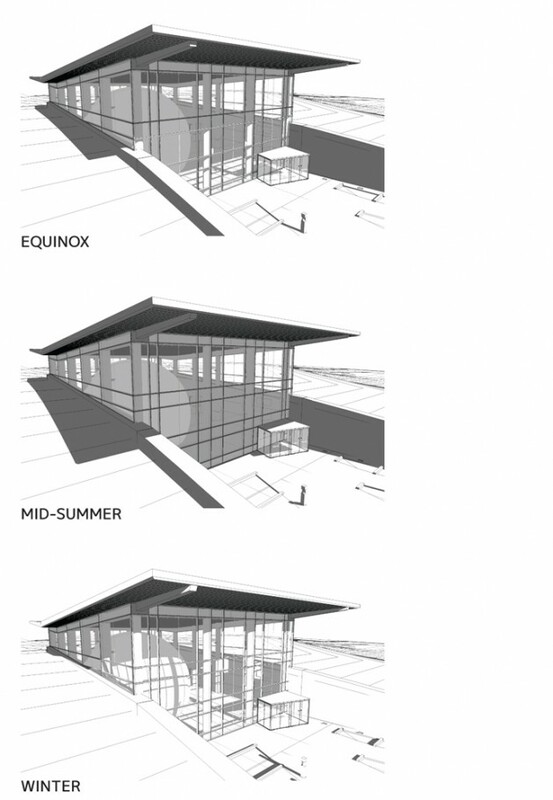 The roof overhang allows sun penetration in winter, while shading the interior in summer. The Museum Wing is located north of the Discovery Hall. It has a vegetated roof that slopes from 19 feet on the west wall, to 11 feet at the retaining wall on the service corridor side. This configuration allows for collection storage equipment to be between 7 and 9 feet, and provides up to 15 feet clear height in the Exhibit Galleries. The west wall of the Gallery will be red sandstone. 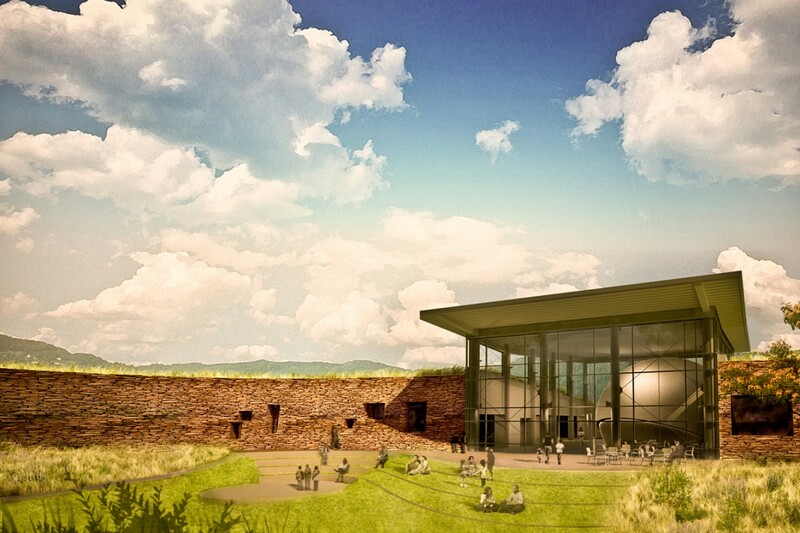 Window locations in the sandstone wall are completely flexible and will be coordinated with the layout of the exhibits, providing daylight and views where needed. An Outdoor Exhibit area is located at the north end of the Museum Wing. This may be enclosed in the future to meet expansion needs. The Education & Office Wing is located south of the Discovery Hall, and is similar in height and finish as the Museum Wing. Administrative Offices are positioned to take advantage of windows and views of the open space and park to the west and to the north. The ceiling height in the Office area is utilized to house the air-handling units for this side of the building.